The unlawful possession of firearms is a serious misdeed in any democratic community, and the United States Of America are no exception. For things like this, the prominent rapper Lil Wayne was sent to prison for right months. Having found himself in a new surrounding, he did not have to shoot, but was given enough time to think over what he had done. We can not know for sure if he repented his behavior, but what we can be certain about is that he did not forget to think about music. Before the man was at large his new long player, I Am Not A Human, was released, right on his birthday, September 27, 2010. So far, it is available only on-line and the CD with this material will be prepared when the winter months are at hand. It is well known that initially there had to be only an EP with a title like this one that was aimed to get the audience ready for a widely speculated record named The Cater IV. Anyway, we have got another ten new songs from Lil Wayne, which states that a true creator can create even in confinement. I Am Not A Human Being was prepared by Lil Wayne backed reliably by his old buddies and hip-hop colleagues, Drake, Nicki Minaj, T-Streets, Jay Sean and Lil Twist. Drake was the one out of this company who made the most significant contribution as he placed his vocals already into the first track, Gonorrhea. You will feel quickly that the song structure was built freely with all the loops alternating each other without a definite pattern. The same can be said about the following, Hold Up. Drake, as if having obtained confidence, returns once again in number three called With You. The ballad-like sad intonations fades away as soon as the title track steps in with its rock-n-roll nonchalance. After the mid-tempo I’m Single, we come across another experimental song, What’s Wrong With Them. There are not too many words here and the structure again is somewhat obscure, but the song does possess a certain feeling. Wayne comes back to his more traditional style only in the concluding part of the album, offering a very impressive piece called Bill Gates. Just a warm-up before the new record? 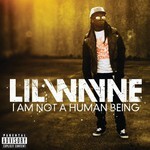 Lil Wayne’s I Am Not A Human Being is quite a diverse record. The man’s old fans will definitely be happy to know that the largest portion of the new material represents Lil’s usual manner. On the other hand, they will not be happy at all to know that pop-music as well as rock-n-roll still inhabit the singer’s mind and even influence his creative process. Of course, it is not another Rebirth since rap takes the leading part here, but Wayne seems to be looking for something to add to rap. It will be interesting to see what mission the artist assigned to this release. Might be so that he simply wanted this album to show that he is still crazy about music and looks forward to returning home (by the way, the guy is going to be released before the stated time for good time) and making another CD. We are talking about The Carter IV, that very long player with which Lil connects his high hopes. In the meantime, I Am Not A Human Being is, probably, only a reminder about his existence. Many even share the suspicion that the songs for this record’s set are leftovers that failed to go through to the previous albums. Even if it is so, I Am Not A Human Being is quite an interesting and worthy work to try.